You, your family and friends are welcome to View our Venue and meet our team. Our Events Team has over 30 years experience in making your event worth remembering. Our team of professionals are dedicated to ensuring your occasion is well planned and organised. We want your special occasion to be celebrated with a high level of service, class, elegance and sophistication, leaving you, your family and friends with the time to celebrate and create memories of your special occasion. See why the award winning Holroyd Centre is your place to celebrate by taking the time to View our Venue. The process to view our venue is simple and there is no obligation to book. 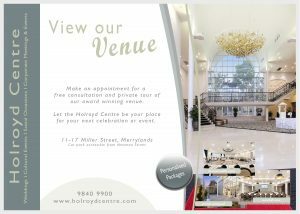 Simply phone the Holroyd Centre Functions and Events Team on 02 8757 9090 to arrange an appointment to take a tour of our stunning venue. 1) What to consider when viewing your Wedding Venue? 2) What kind of Wedding Day would you like?